Oatmeal soap is great for soothing and preventing dry, rough skin. It can also ease itching and other skin ailments. 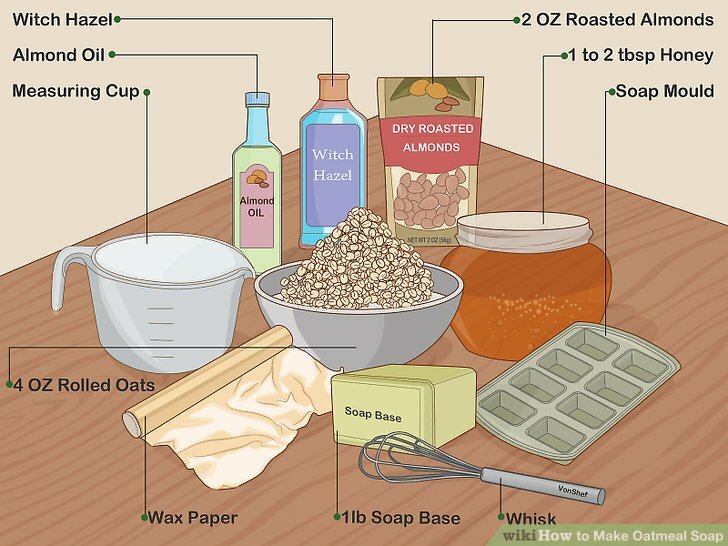 Oatmeal soap can be pricey to buy, but it’s cheap and easy to make. The quickest and easiest way to make oatmeal soap is using a melt-and-pour soap base, but you can also make your own soap from scratch. 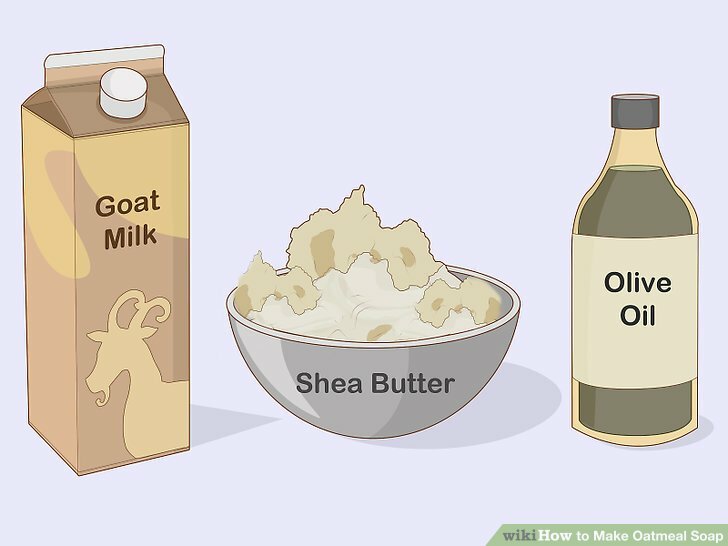 Craft shops have many different soap base options: goat’s milk, shea butter, and olive oil are popular choices. Most importantly, choose a suspension formula to ensure that your oats won’t sink to the bottom of the soap during the cooling process. 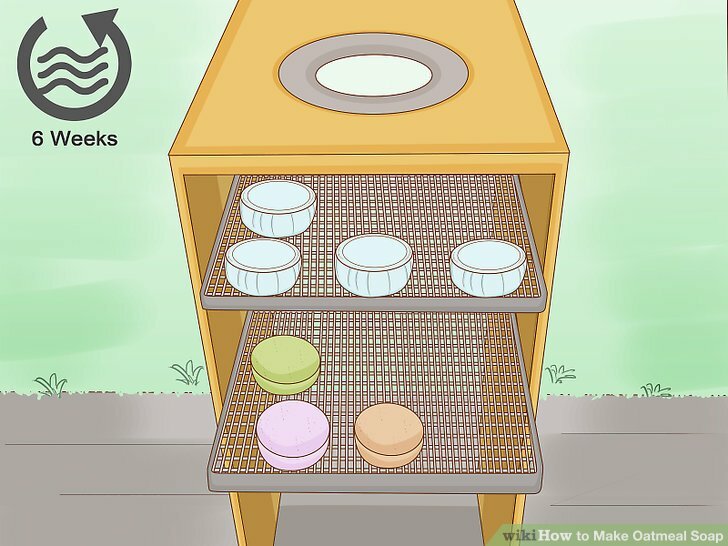 Soap bases are often called “melt-and-pour” soap bases by crafters, since all you need to do is melt down the base, add your ingredients, pour it into a mould, and then let it cool. 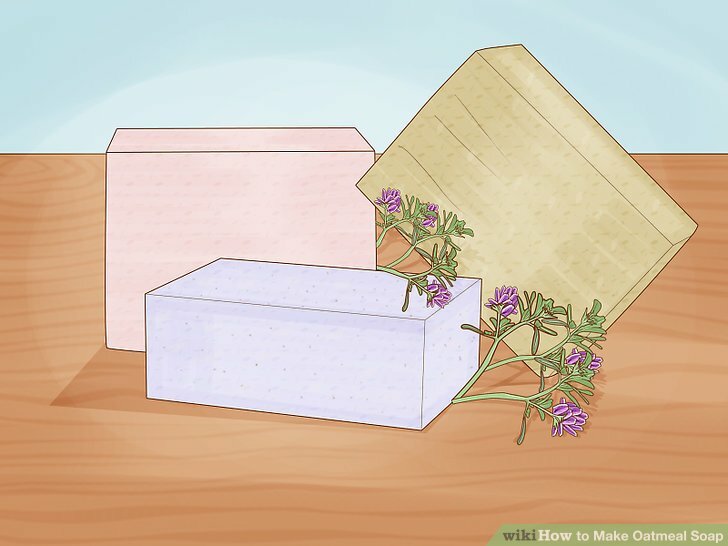 If a soap base isn’t easy for you to obtain, you can also purchase a regular bar of soap and just melt it down, add the oats, and let it cool. Any soap bar will do, although one with higher-quality ingredients will make your skin feel nicer. You can use whatever moulds you like for this recipe. 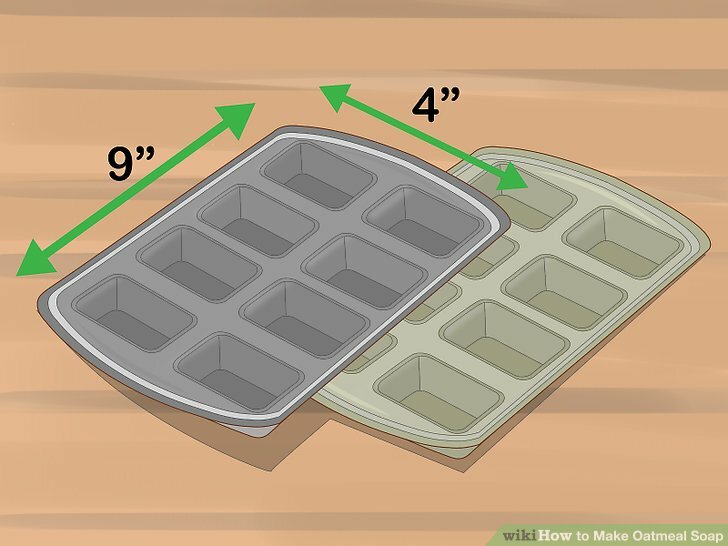 If you’re making regular bar soap, you can get away with using a 9 x 4 inch baking pan. You can really use whatever shape you want though. If you use metal or plastic containers that aren’t specifically made for soap, be sure to line them with wax paper or parchment paper before pouring your soap into them. This will make it much easier for you to remove the soap once it’s cooled. Some soap-makers even line their professional soap moulds. This helps prevent the soap from getting stuck in the corners of rectangular and square moulds. If you’re using moulds with more detailed shapes, you won’t want to line them as this will obscure the design. Add your oats to a coffee grinder or food processor, or crush them using a mortar and pestle or rolling pin. You want to make an even, fine powder from the oats. This is called colloidal oatmeal and is great for soothing your skin. 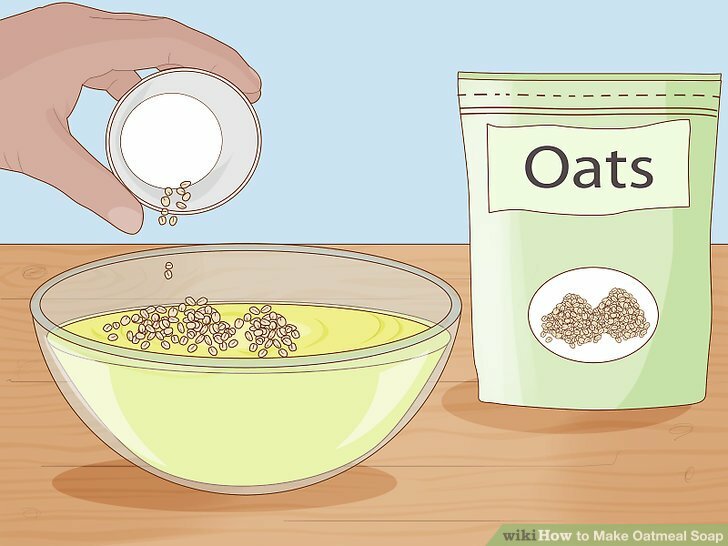 If you’re using a food processor, it will likely take between 5 and 10 minutes to get the oats down into a fine powder. Add almonds to the oat mixture (optional). Add almonds to the ground oats and grind together until they are both ground down into a fine powder. Be careful not to overdo it with the almonds, otherwise you’ll end up with almond butter. 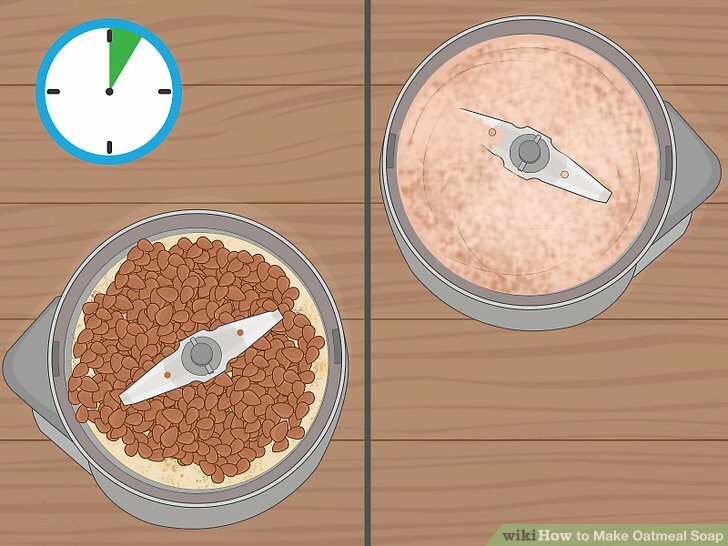 If you’re using a food processor it will likely take another 5 to 10 minutes to get the almonds ground down into a fine powder. Melt the soap base down. You can do this by placing it directly in a saucepan over low heat. Another option is to place it in a large heat-proof bowl and place that bowl in a saucepan full of a few inches of simmering water (i.e. a double-boiler). You can also melt the soap base down in the microwave. 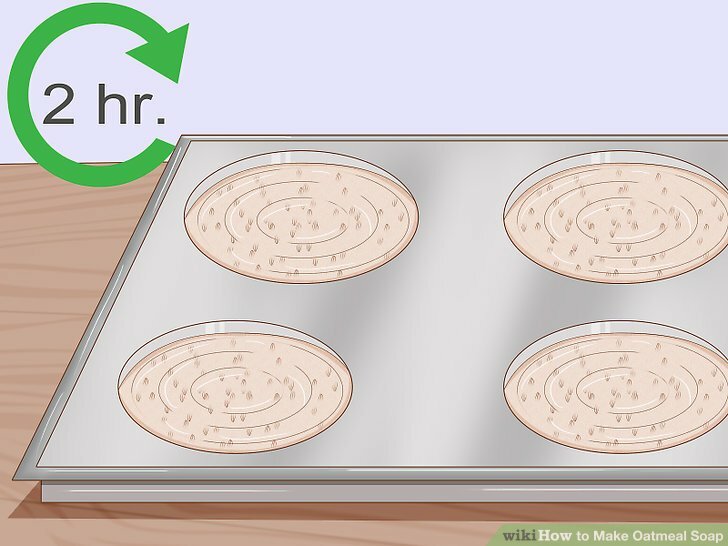 For this option, you’d put it in a heat-proof container (ceramic or glass) and then microwave in short intervals (probably a minute at first, then 15 to 30 seconds at a time) until it’s completely melted. For all three options, be sure to stir the soap constantly to make sure it’s fully melted and doesn’t get scorched. If using the microwave, take the soap out and stir it in between intervals. 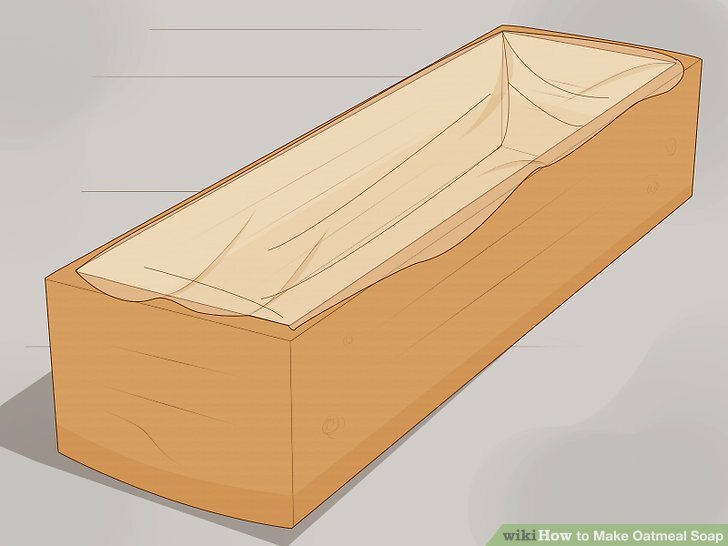 Pour the melted soap into a large container. This will likely be a large, heat-resistant mixing bowl or measuring cup. Stir in your oats and other optional ingredients. 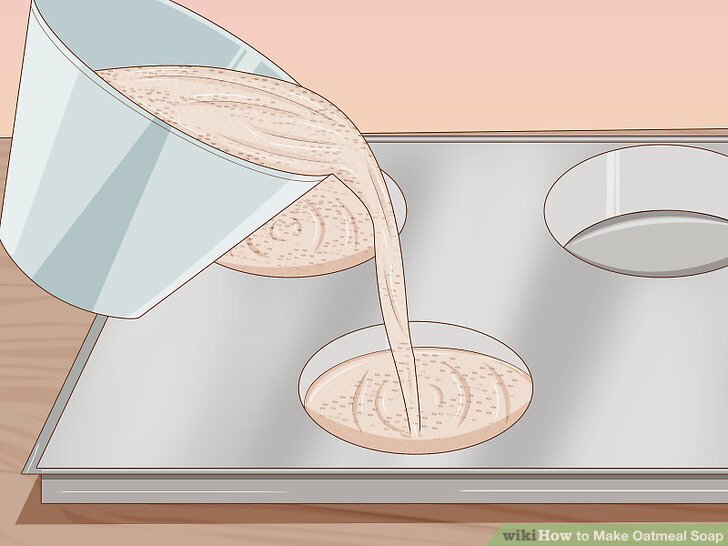 Pour your oats (or almond-oat mixture) into the melted soap mixture while stirring it, ensuring that it’s well-mixed and that there are no clumps. 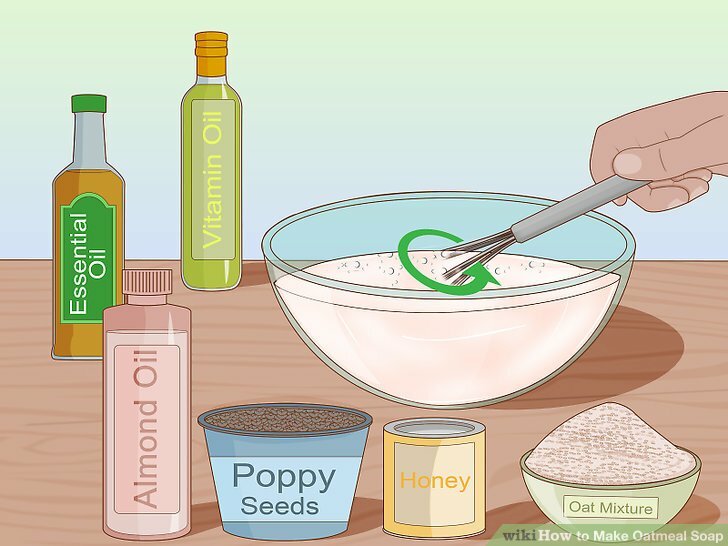 If you’re also adding honey and almond oil to the mixture, add these wet ingredients to the melted soap before you add the oats/oat-almond mixture. This will ensure the liquids are evenly distributed. This is the point at which you can add any other ingredients you’d like to add to the mixture. Common ingredients that soap-makers like to add to their bars include vitamin E oil, essential oils (lavender and orange blossom are popular scents), and poppy seeds (alone, not with oats). Pour the soap into its mould. If you’re using a baking pan, plastic container, cardboard box, or other rectangular-shaped mould, don’t forget to line it to make soap removal easier. Allow the soap to cool. The soap should cool and harden within 2 hours at room temperature. You can also place it in the fridge to speed up the cooling process if you like. Remove soap from the mould. Carefully remove the soap from its mould/pan/container. If applicable, cut the soap into bars. Use a sharp knife to make clean cuts. You might even score the block of soap before cutting it, just to ensure the blocks are fairly even. If you have a metal ruler, you can use this to help you draw lines on the soap block with your knife. Your soap is now ready to use. In general, you’ll want to use homemade soaps within 1 year of making them. If you live in a hotter climate, this time might shorten to 6 months. 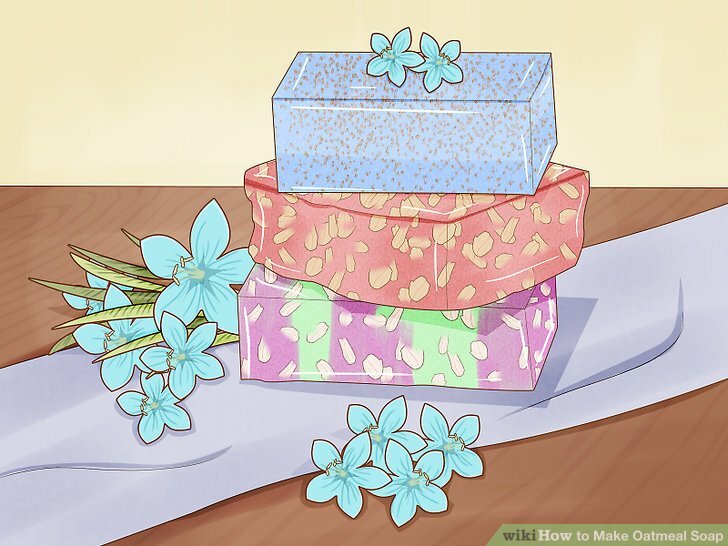 If you’re giving the soap away as a gift, make it look extra fancy by wrapping it in parchment paper and tying it with twine. This recipe makes roughly 2 pounds of soap. How many bars that is will depend on the size of your mould. If you don’t have a mould, use a small cardboard box or plastic container. 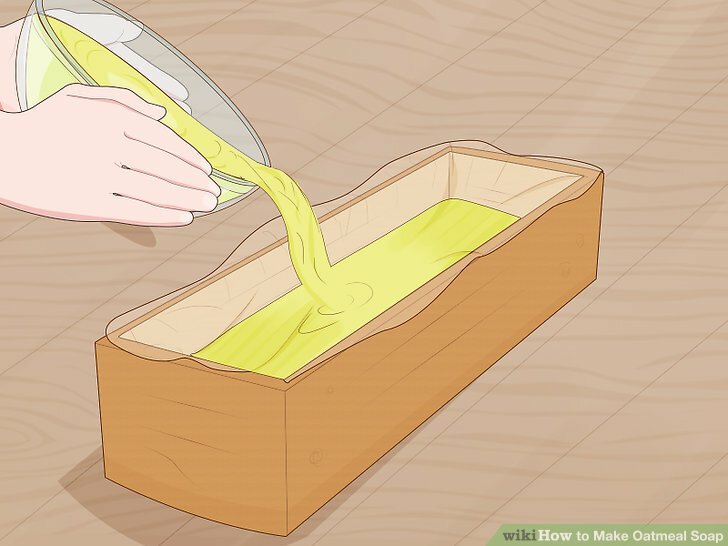 Regardless of whether you’re using a proper mould, a plastic container, or a box, line it with some cling wrap, wax paper, or parchment paper to make the soap easier to remove once it’s cooled. Put on your protective goggles, rubber gloves, and face mask. 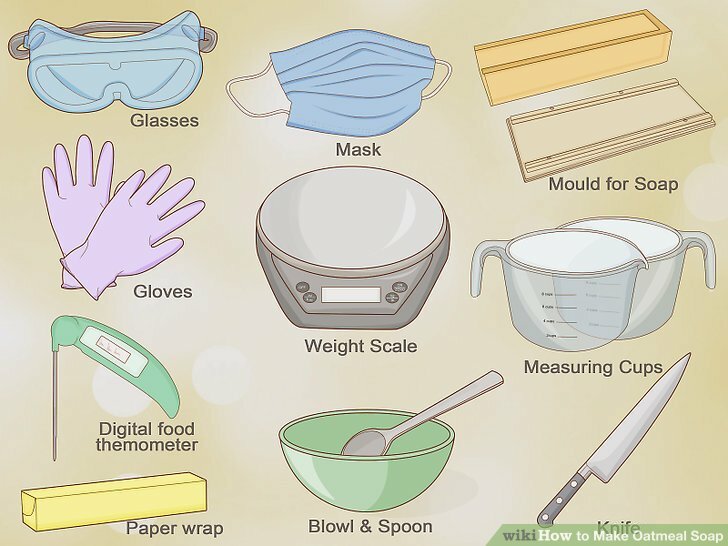 You should also wear skin-covering clothes in addition to the protective gear, as lye will burn your skin. Do not take this advice lightly: lye burns can cause serious, permanent damage. If lye gets on your skin, brush off any solid material and flush with water or saline for 15 to 30 minutes, remembering to protect your eyes. If it gets in your eyes, flush them with lots of water for a minimum of 15 minutes. Inhaling lye can cause breathing difficulties. 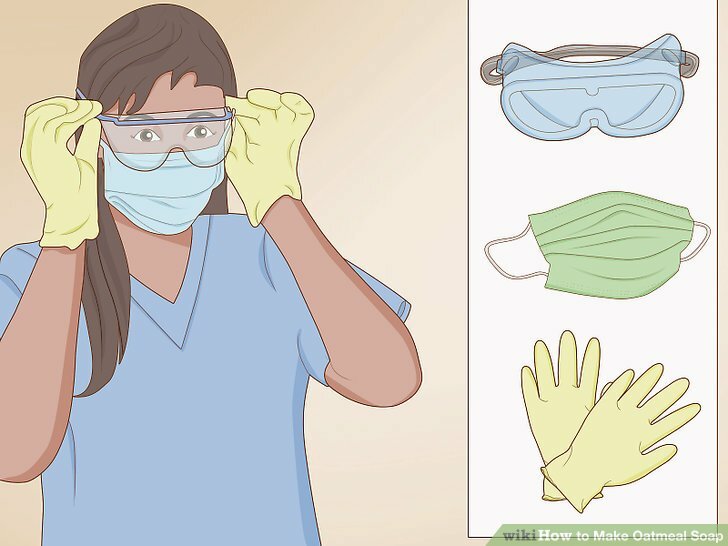 Many soap makers only use gloves and goggles, but really you should be wearing a mask, too. Weigh and pour 2.25 oz of lye into bowl. Use a plastic, ceramic, or glass bowl. 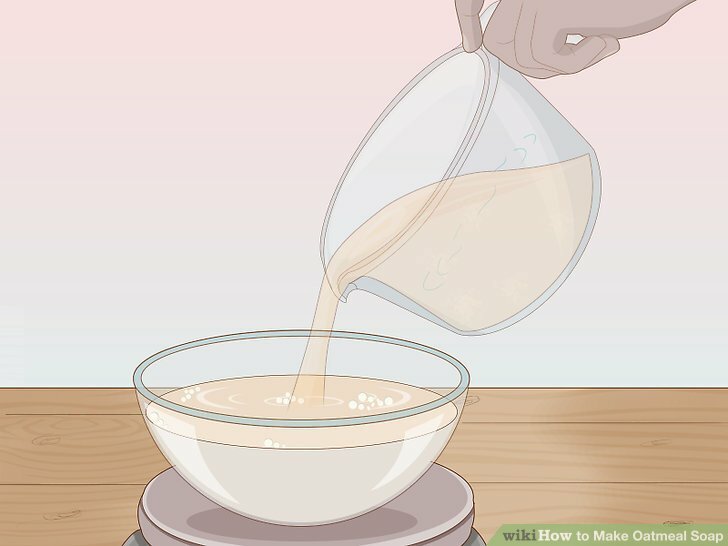 As you pour the lye into the bowl, be careful that you do not inhale any of the powder, or that it does not get on your skin. 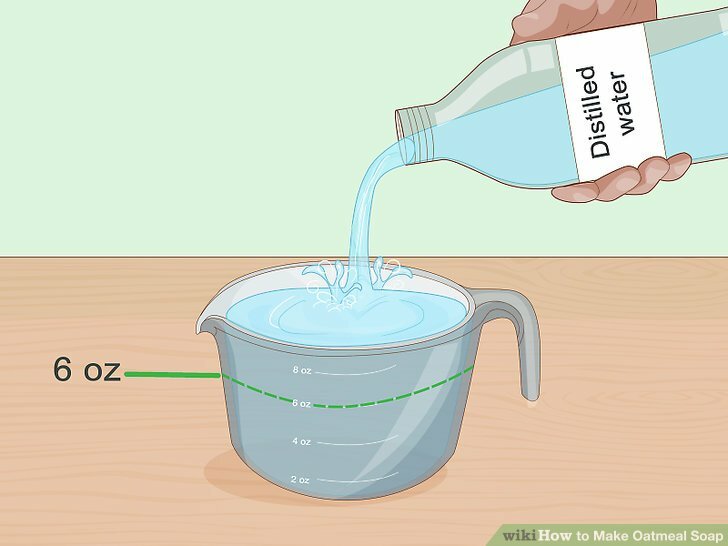 Weigh and pour 6 oz distilled water into a glass measuring cup. You should be able to find distilled water at either your local grocery store, health food store, or drugstore. 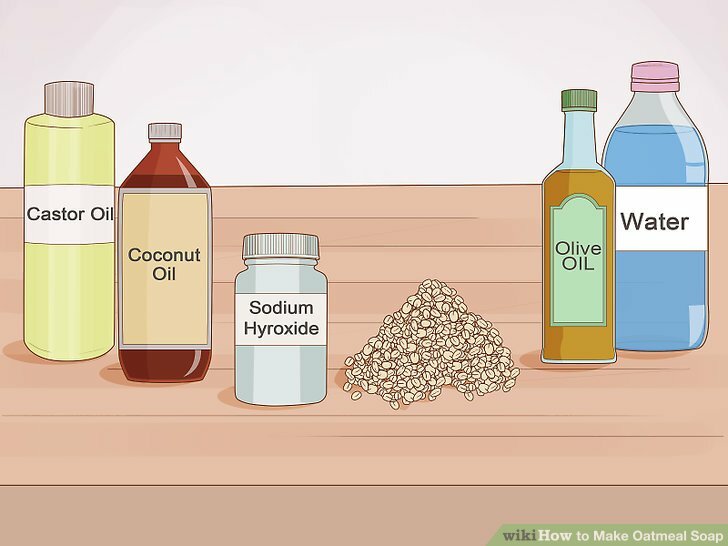 You can also make your own distilled water by boiling tap water in an enclosed container that is connected to another container. The steam rises from one container and condenses into the other one, forming distilled water. Pour the lye into the water slowly and stir. 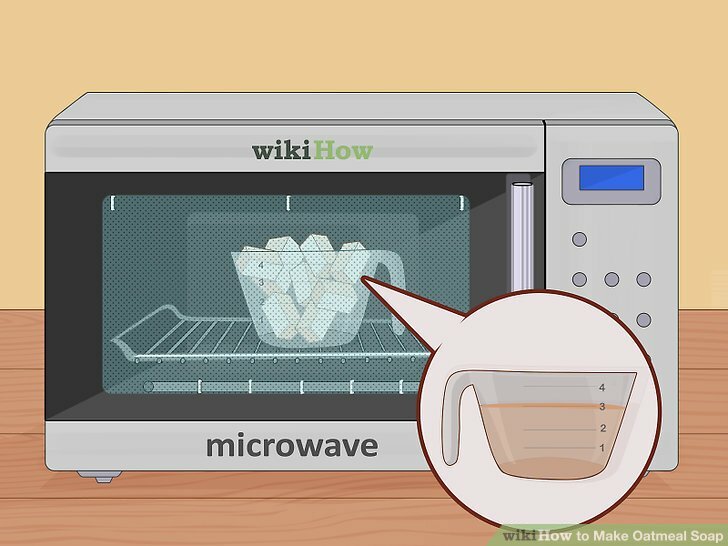 Adding the lye to the water will generate heat and fumes, so be very careful while doing this. Once the lye is all in the water, stir it until it dissolves. You should NEVER add water to lye. Adding water to lye will cause a strong reaction, with the solution erupting up out of the container, possibly causing injury to you. If you want to reduce the cooling time of the water-lye solution (remember, it’ll generate heat! 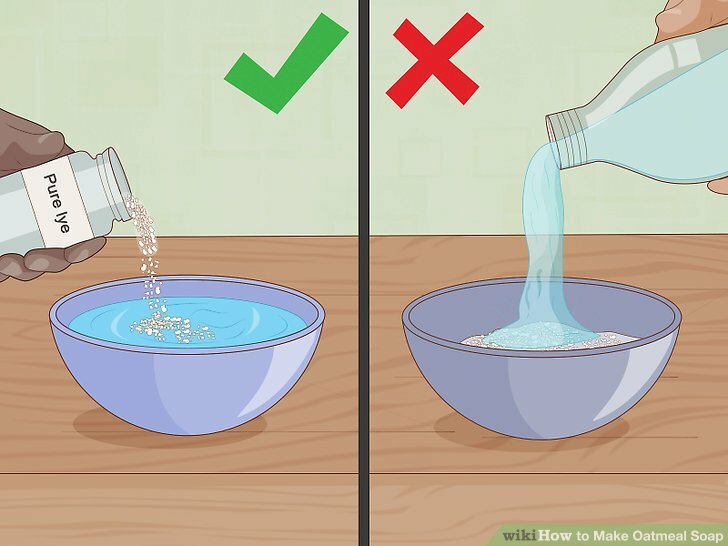 ), you can start with cold distilled water. Weigh your oils and melt them together. Add your coconut oil (6 oz), olive oil (10 oz), and castor oil (0.45 oz) to a heat-resistant glass measuring cup. 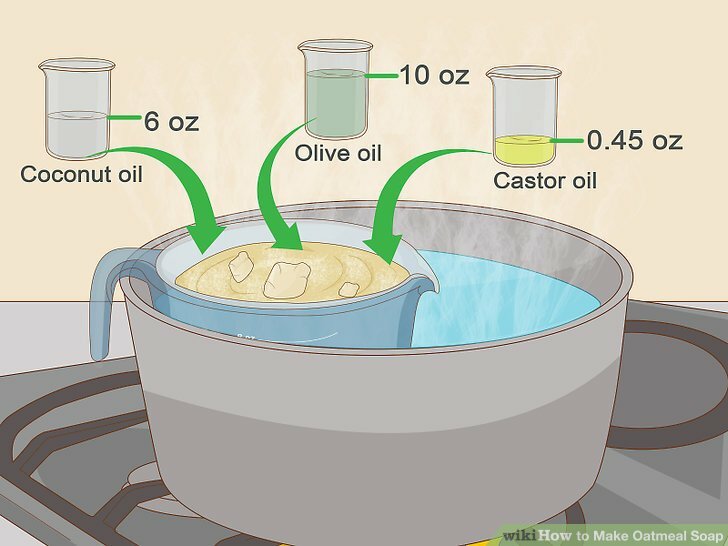 Place the cup in a saucer of simmering hot water, or microwave it in 30-second intervals until the oils have all melted together. Only heat the oils to the point of melting. You want to avoid them being too hot, otherwise it’ll slow your process down as you want the oils and your lye water to be the same temperature when you mix them. 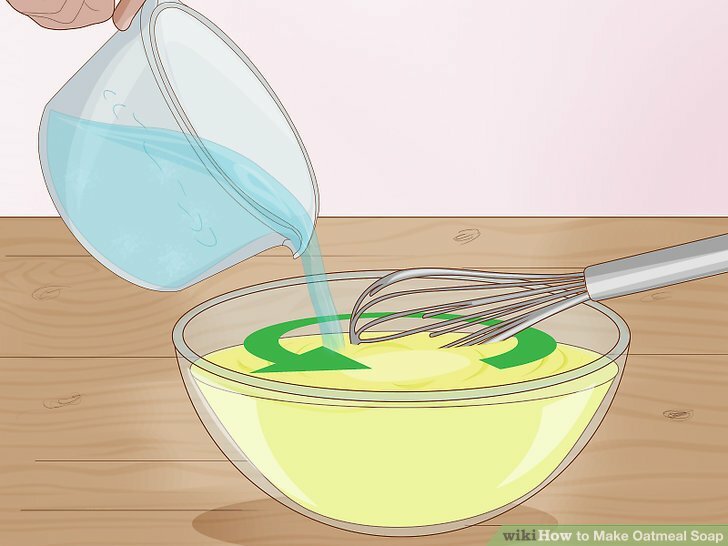 Mix the lye water and oils when they reach similar temperatures. 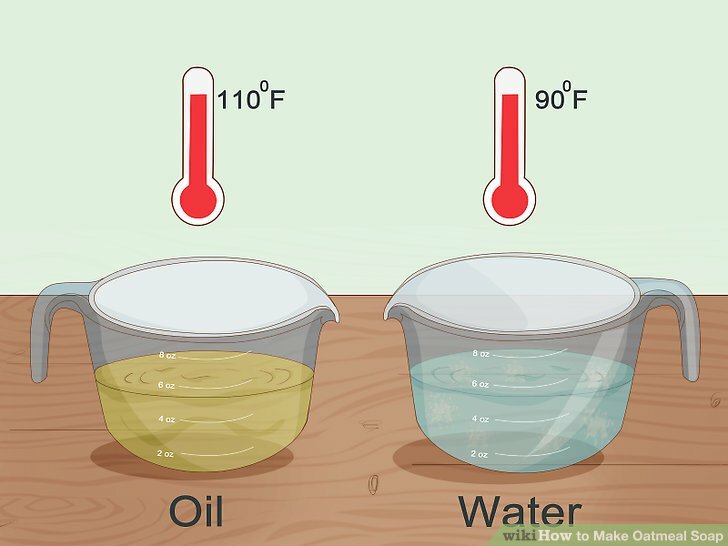 The lye water and oils should be within 20 degrees Fahrenheit of one another when you mix them. They will likely be somewhere between 90 and 110 degrees at this point. Use the digital thermometer to ensure that this is the case before mixing them together. Make sure that you mix the oils and lye water while they’re still warm, otherwise they won’t mix together as well. Closer to 110 degrees Fahrenheit is preferable. Pour the lye water into the oil mixture. Do this slowly while continuing to stir. Measure the mixture’s temperature at this time to see where it’s at. You can do this with a stainless steel whisk or a hand mixer. A hand mixer will take much less time than a whisk, but both are okay. You’ll know the mixture is ready when it becomes thick and cloudy-looking. 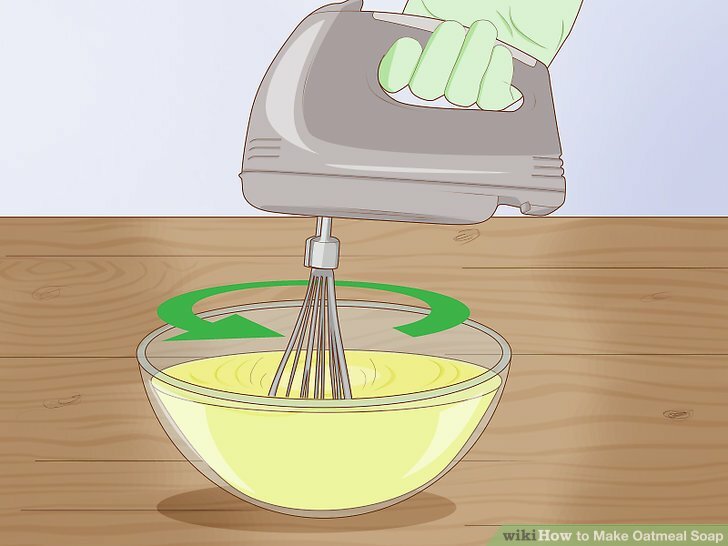 You should be able to lift the hand mixer or whisk out of the mixture, and the drippings should appear on the surface of the mixture rather than disappearing right into it. You can also check the mixture’s temperature to make sure it’s ready to go. If it has risen a couple of degrees Fahrenheit from when you last checked it (i.e. when you combined the oils and lye water), you’re doing well. Once the lye water and oils have been thoroughly combined, you can add additional things to the soap. In this case, you’ll be adding oats. You can add as little or as much as you like, depending on your own tastes. For the best skin-soothing results, use colloidal oatmeal, which is simply oatmeal that has been ground into a fine powder. You can make it yourself simply by grinding regular porridge oats into an even, fine powder using a coffee grinder. 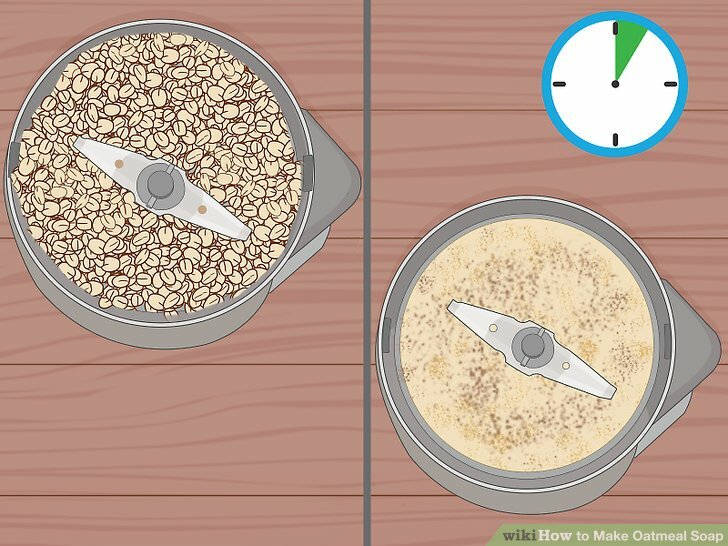 If you don’t have a coffee grinder, you can also grind the oats up manually using a mortar and pestle, or by crushing them with a rolling pin. Pour the soap mixture into your mould and store. Once it’s all in there, cover it up with plastic wrap and then store it in a cool, dry place for a couple of days. After 2 days, put on your gloves, goggles, and face mask, and check on your soap. It should look solid and fairly smooth. At this time you can take it out of the container and cut it up. Be sure to wear your protective gear because the lye will not have completely neutralized at this point, and can still cause you harm. If your soap looks crumbly, crusty, or has liquid or powder floating on top of it, you’ll need to throw it out and start again. If you’ve followed this recipe exactly, though, this shouldn’t be a problem. 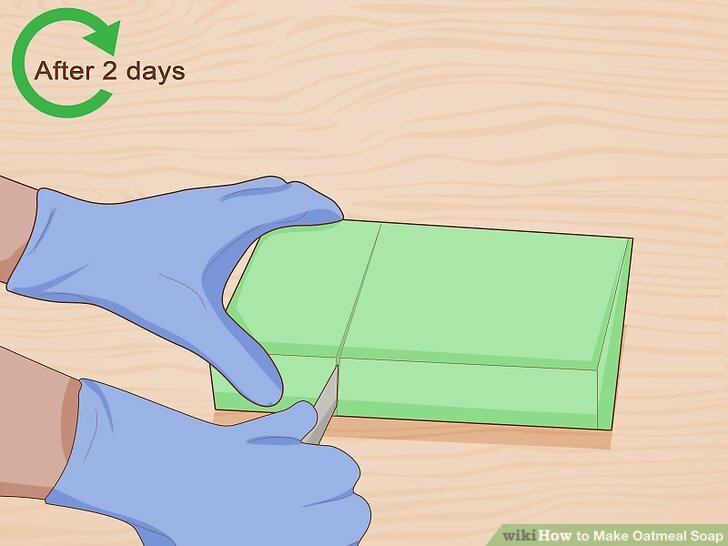 After cutting it up, let the soap sit and dry for at least 3 or 4 weeks. Some experts recommend curing your soap longer, up to 6 weeks. You’ll need to turn your soap bars once a day just to ensure that they dry evenly on each side. Allowing the soap to “cure” will give it time to harden, dry out, and become more gentle as the pH of the soap lowers over time. A bar of soap that hasn’t been properly cured will feel softer, slimier, and stronger than a well-cured one. Your soap is ready for use now. It’s best used within one year of making. If you live somewhere hot, you should probably use the soap even sooner, within 6 months of making it.